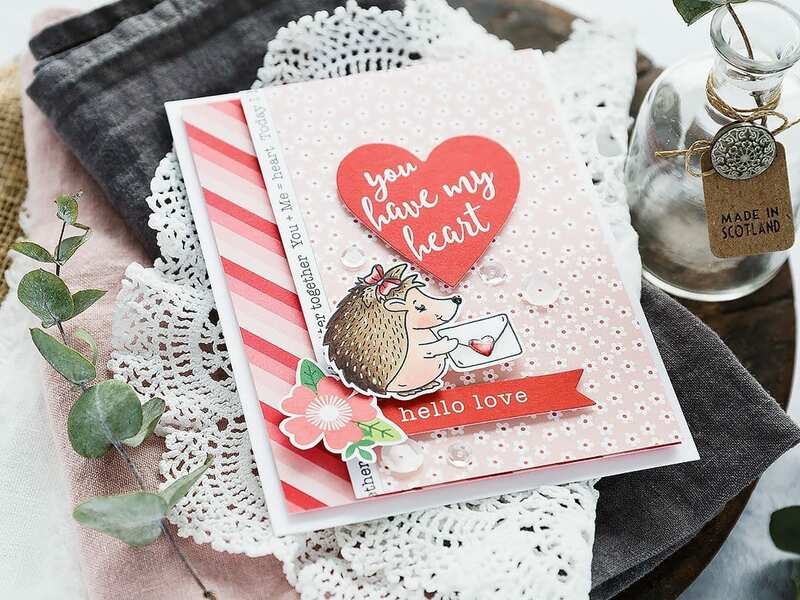 Today I have a cute hedgehog Valentine’s card to share using products from the Limited Edition Valentine’s Kit from Simon Says Stamp. Now, as usual with these Limited Edition kits, the kit has sold out. However, many of the supplies are available individually, and today I’m using one of the stamp sets from the kit which is available separately. I’ve linked all supplies at the end of this post. Compensated affiliate links used where possible at no cost to you. 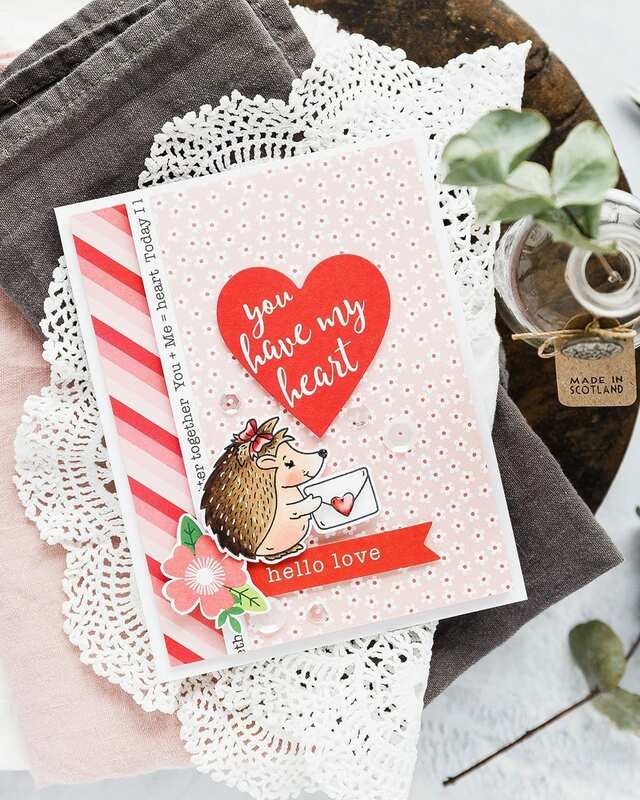 The Sweetest stamp set from Simon Says Stamp has the cutest critters, all of them are adorable but it was the hedgehog who won my heart! 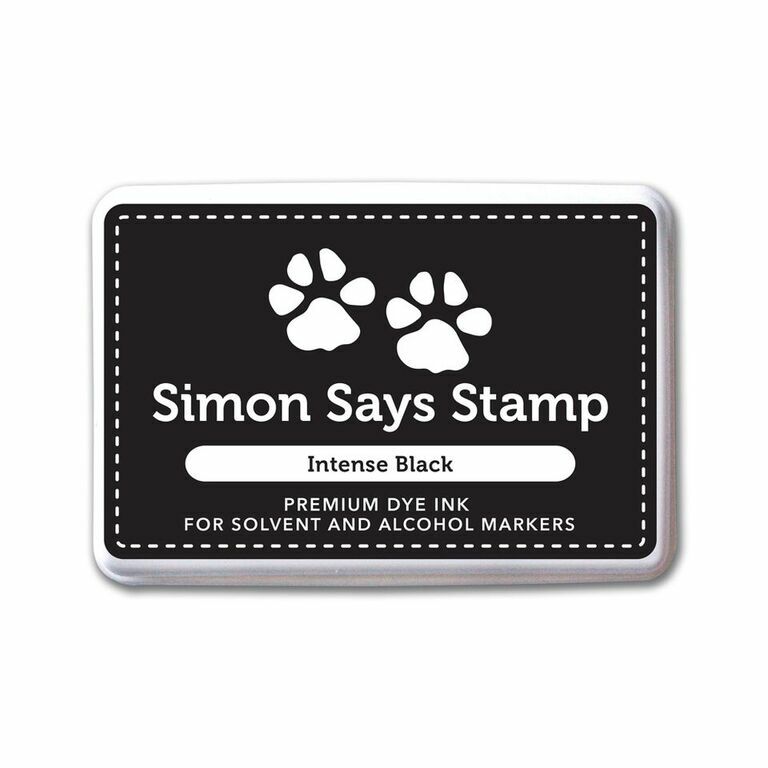 I placed the hedgehog on a piece of Neenah Solar White card in the Mini Misti and closed the door of the Misti to pick up the stamp and then I inked it with Intense Black ink from Simon Says Stamp. I chose this particular ink as it is Copic friendly. I stamped twice to get a good impression and then pulled out my Copic markers to colour him in. My colouring process is quite simple. I chose a few shades within the same colour family and then try and build in shadows and highlight areas into the colouring. Sometimes I start with the lightest colour and build up to the shadows and sometimes the reverse but either way I work the transitions from one colour to the next to get a smooth blend. Having trimmed the hedgehog out with scissors I then pulled out the Pebbles Inc Loves Me Icons ephemera printed cardstock shapes and started to play around with the ones that appealed to me and I felt went with the hedgehog. 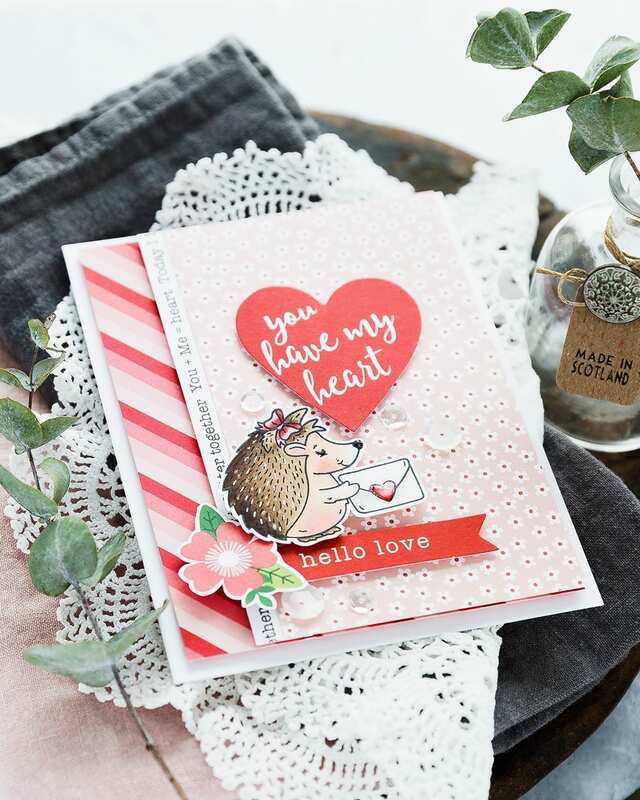 There are a pile of shapes included in the pack from cute images to banners and sentiments. I was drawn to the images with pops of red, in particular, the large red heart and smaller hello love banner. Next, I pulled out the Pebbles Inc Loves Me patterned papers and this is how I choose papers to use. I lay the coloured images and top and then move in different options until I get a combination of patterns/colours which suits. There is a design rule when thinking of colours and patterns that of the gallon, pint, quart which basically means that to get a combination that works well you think about using more of one pattern than the others, then have a smaller piece of a second pattern and then finally just a touch of a third pattern. For this card, I used mainly the pink floral paper with a touch of the striped paper and then just a dash of the text paper. I trimmed out a little floral accent from one of the paper shapes, and I was ready to put the card together. I cut, scored and folded a Neenah Solar White card base using the sturdy 110lb weight and I also trimmed all the pieces of patterned paper to fit too. I added foam adhesive to the back of the striped paper and adhered it to the front of the card base. And then I ran a Gina K glue runner along the back of the floral piece and adhered the text strip before adding more foam adhesive to this panel and then adding it on top of the striped paper. I trimmed the little paper nubs away that you often get on these printed shape pieces and then added foam adhesive to the back of the remaining elements and arranged and attached them to the patterned paper. I used the ‘hello love’ banner to ground the scene with the flower element hiding the hole which you could thread with twine. I then added the hedgehog in place and finally the big red heart. As a final accent, I used some of the sparkly clear and opaque white sequins from the Girl’s Best Friend sequin mix and kept them in place with Gina K Connect Glue. I then added a little sparkle to the red heart on the envelope with a Spectrum Noir Sparkle pen and added Ranger Glossy Accents on top for shine. I also added Glossy Accents to the hedgehog’s nose. To accent the hedgehog’s spines, I drew in white lines with a gelly roll pen and also added a few gold lines too for variety. I did want to add a sparkle to this little guys eye too but and for this, I used a black glaze gelly roll pen. Love this little card Debby. Sweet stampset and gorgeous papers. Thinking about ordering the items, but think I might be pushing it in time for Valentines Day. I suppose I could always use them for Anniversaries. Thank you for sharing. The layout of the card is really gorgeous. Such a sweet card and Thank you for the video! 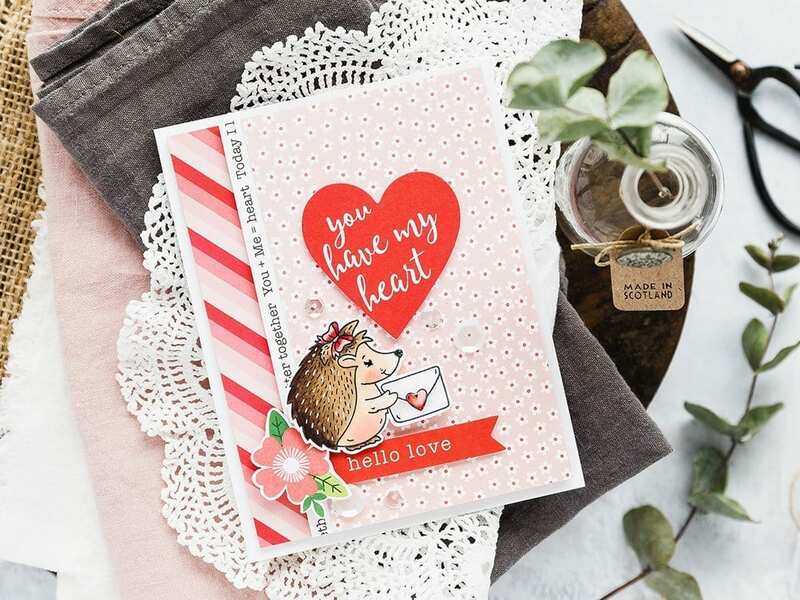 Gorgeous love card, the Hedgehog is so gorgeous. Thank you so much for showing Debby. Adorable card. The Pebbles embellishments are sweet. Oh Debby, this is so cute. The hedgehog is adorable and the touches to his spines with the white gel pen really made a difference. Wow, just that little touch of detail…. I love your card! You have inspired me to use my kit! Thank you!